Recently I’ve been experimenting with Laravel Forge and Linode to build a new server platform for the new CloudMonitor app I’m currently building (http://www.rockandscissor.com), and after a couple of attempts and quite a few support tickets to Taylor Otwell, Creator of Laravel and Forge, I’ve finally managed to configure a Load Balancer and 2 servers running a MySQL Master-Master sync, and using Unison to keep the web directories synced. However I came across a problem which is fairly common on Load Balanced or Reverse Proxy setups that use SSL. The Load Balancer itself terminates the SSL connection on port 443 and the traffic is sent from the Load Balancer to the servers across the local network on port 80. The problem arises with any software that uses the $_SERVER[‘HTTPS’] = ‘on’ global variable such as WordPress, Magento, OpenCart etc due to this global variable not being set, this is because traffic comes to the server through HTTP (port 80) instead of HTTPS (port 443). 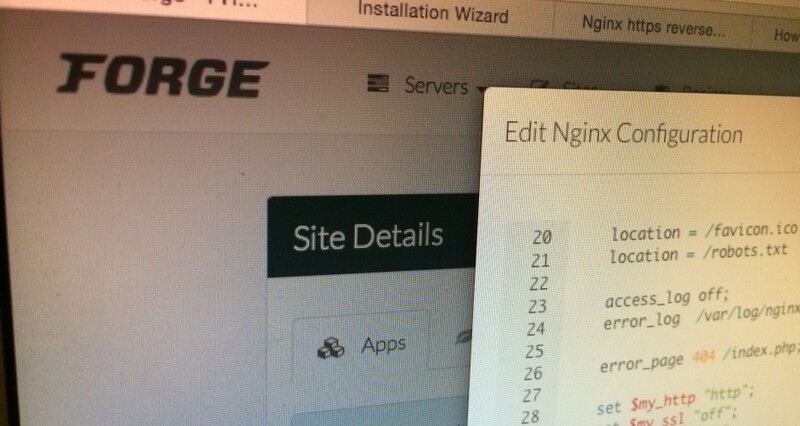 Many thanks to Taylor Otwell for responding to my continuous questions and Sonassi.com for their great article which pointed me in the right direction for my Nginx Reverse Proxy/Nginx setup: Magento HTTPS Re-direct Loop.